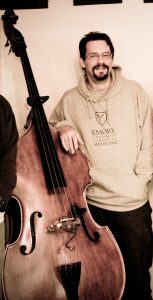 John is an active freelance guitarist, bassist, vocalist and bandleader based in Atlanta, GA.
John plays rock, jazz, classical, blues, acoustic, country and other styles of music. He can perform solo, with a duo or trio, or with one of his ensembles. John is an experienced musician who has performed in well over a hundred venues in a dozen states. The music on this site is organized by Style, Ensemble and Event Type. To discuss music for your event please contact John at john@johnwillingham.com or 404-819-5911. If you are a music industry professional seeking an experienced skillful musician, please know that John approaches every engagement with craft, creativity, and enthusiasm. He possesses excellent reading skills, is comfortable improvising parts in many styles and has extensive experience following a conductor. John has a calm, amiable manner and is easy to work with. Please see John’s resume for more details about his skills and experience. John is an experienced and patient teacher. He teaches bass and guitar to students of every level. He offers in-home lessons in neighborhoods close to Emory University including Druid Hills, Virginia Highlands, Decatur, Candler Park and Lake Claire.